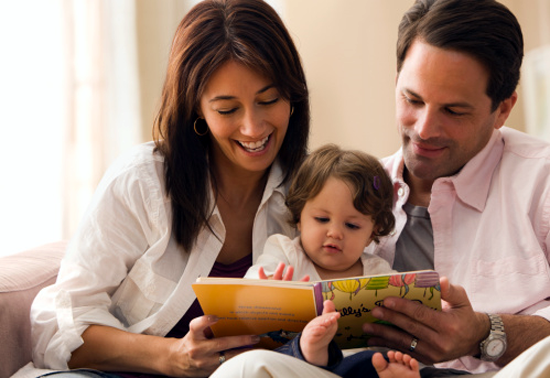 While the idea of reading aloud to your baby may sound silly, it has several benefits. Firstly, it is an excellent stimulation for the baby’s brain. You may not realize it, but your baby is absorbing all your spoken words and your tone and tenor as you read aloud a story. New words and sounds are memorized by the baby and when he is ready to speak his linguistic abilities may amaze you. Reading aloud stories to baby also helps in building an emotional bonding between you and your baby. This is the time when you connect with your baby. It is important that reading time has to be a daily activity. Newborns need a quiet reading environment. Fix a time for reading to your baby when the older sibling is in school and there is no other distraction in the room. This peaceful atmosphere promotes greater bonding between you and your child. Also, it soothes the baby and you feel calm and relaxed too. Remember that newborns are always relaxed by their mother’s voice. Hold and cuddle your baby as you read aloud and you will have a life-long bonding with your special one. Ideally, big picture books with few written words are better for the baby. Hold the book closer to his face while reading it. If the text is too much, you do not have to read the entire text. Focus on your voice modulations. Exaggerate the emotion displayed with lot of hand and face movements. Your “drama in action” holds the baby’s attention and helps develop his memory. Read the same book aloud frequently so that he can remember the book and look excited as you hold it in front of him. Choosing the right book to begin reading for your new-born is an important decision. The book should not be a thick one. It should have large pictures, preferably human and animal figures and bright scenery. The words have to be few. The story need not have a message or lesson for the children. Let your baby turn through the pages on his own. Help him by stressing on some of the words. Give long pauses between your dialogue deliveries. Repeat the same book for several days, till he starts recognizing the book and starts looking forward to the special time with you. Appreciate his baby language in response to your reading. However, do not babble yourself in response. It is important for the baby’s speech development to show your love and attention with proper speech. This will help him in learning new words and sounds. In the movie Baby’s Day Out a wealthy baby is kidnapped by three incompetents, he escapes while being pursued by the three kidnappers. The toddler’s adventures in the city are similar to a baby’s adventures in the story book that was daily read aloud to the wealthy baby by his nanny. It appears as if the wealthy baby shown in the movie was inspired by the book his nanny used to read aloud to him. The movie certainly helps in conveying the idea that books stimulate a baby’s imagination and all his senses! Reading habits are not developed in a day. There is no age criterion for showing interest in books. Instilling the love of books in your baby is the best gift you can give him for life. Well done Radha. Yes reading habits are not developed overnight and kids have an uncanny power to absorb things and use them later in life. They are like speaking mirrors and reflect everything they see and hear.